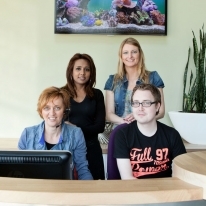 Customer service - Dimple B.V.
We, the customers service team, are available from Monday to Friday from 08.00 – 18.00 hours by phone 0031 – 251 316302 or by email cs@dimple.nl. We are your service desk. You can ask us any question and we will give you the answer eighter straight away, or get feedback from our production, expedition or export department. So if we cannot help you instantly we work with a maximum respond time of 2 hours. We will see to it that you get the information you want, rapidly. So if you need prices, samples, track and trace or other information, or of course if you want to place an order, please feel free to contact us. It will be our pleasure to support you. Questions on the financial side? If you have any questions regarding finance, you can contact Angelique Limmen. She’s available by e-mail, Monday to Thursday between 08.00 – 15.00CET. Use the button below to send her an e-mail.